"Madame X" she was called. Her portrait was painted and her anonymity was frozen in time. Perhaps in a dream where colors are overly vivid and hyperreal, this is what she wore on her wedding day. The ultraviolet color is created by using many colors of yarn and fabric that blend together in the eye to create a unique vibration of color. This is a three piece ensemble. The bodice comes down to the middle of the thigh so it can be worn alone as a short and eye catching dress. The long skirt is held up by a hooped underskirt. Knit, crocheted, loomed and hand dyed yarns along with dyed and silk screened strips of organic cotton jersey adorn the bodice, the skirt and the train, creating a painterly effect with the materials. Madam X steps from her painting to live again. The dress has a train in the back and has a lowered bustle to accentuate a woman's curves and figure in the most flattering way. 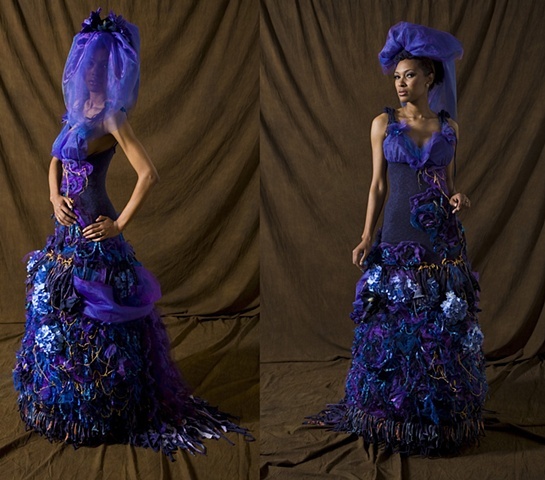 the bustle is made of tulle streamers and fuschia cotton strips that create a more vibrant take on the ultraviolet color. The yarns are a mixture of gold, navy blue and purple textured yarns of various kinds, and ribbon yarns. The detail in the dress is almost too much to take in at one look, but it is the overall effect that is truly breath taking. This dress is a size 4/6. I can custom make this dress in any size and any color combinations that you can dream of. Please allow 3 months for it's creation. Everything on the dress (besides the silk flowers) is hand made with great attention to detail. If you would like a custom order, please contact me and we can go over the many details that will make your dress completely unique and a true work of art.